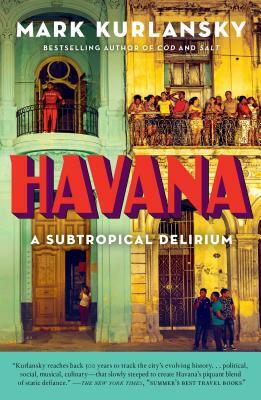 A city of tropical heat, ramshackle beauty, and its very own cadence--a city that always surprises--Havana is brought to pulsing life by New York Times bestselling author Mark Kurlansky. Mark Kurlansky is the New York Times bestselling author of Milk!, Cod, Salt, Paper, The Basque History of the World, 1968, The Big Oyster, International Night, The Eastern Stars, A Continent of Islands, and The White Man in the Tree and Other Stories. He received the Dayton Literary Peace Prize for Nonviolence, Bon Appetit’s Food Writer of the Year Award, the James Beard Award, and the Glenfiddich Award. Salt was a Los Angeles Times Book Prize finalist. He spent ten years as Caribbean correspondent for the Chicago Tribune. He lives in New York City. www.markkurlansky.com. "Kurlansky reaches back 500 years to track the city's evolving history, separating out the different strands--Spanish, African, American, Russian; political, social, musical, culinary--that slowly steeped to create Havana's piquant blend of static defiance." - New York Times, "Summer's Best Travel Books"
"During his decade-long tenure as the Chicago Tribune's Caribbean correspondent in the 1980s, Mark Kurlansky began traveling to Cuba. Since this introduction to the island nation, the journalist grew to know and love the beautiful, messy capital. Drawing on Havana's history, Kurlansky starts with Columbus' arrival in 1492 and examines the city's role in the slave trade and its lasting effects. But he also brings us into the contemporary culture, highlighting the city's lively music, dance and art scenes, and supplying us with recipes to tasty Cuban dishes." - Smithsonian Magazine, "Ten Best Travel Books of 2017"
"Few countries seem as alluring as this island nation, long cloistered from American travelers, which welcomed its first commercial U.S. flight--from Fort Lauderdale--this past August . . . Havana is Mark Kurlansky's cultural history of a city that he began visiting regularly in the 1980s, when he covered the Caribbean for the Chicago Tribune." - Publishers Weekly, "Spring Travel Books"